Prima Donna, the Bastille Day-set opera by Grammy Award-nominated singer-songwriter Rufus Wainwright, will make its Gotham debut in spring 2012 at the New York City Opera instead of the Metropolitan Opera, for which it was originally conceived. NYCO said on Monday that the company would produce it sometime next season. The Met and Lincoln Center Theater originally commissioned the work, “Prima Donna.” But the Met declined to present it because Mr. Wainwright insisted on keeping the libretto in French. Scottish soprano Janis Kelly, who originated the role of aging soprano Régine Saint-Laurent in the world premiere of Prima Donna, will repeat her work in the New York debut. NYCO general manager and artistic director George Steel announced the production as part of the 2011-2012 season. Bernadette Colomine authored the French-language libretto for the opera, which had its premiere at the Palace Theatre in Manchester, England on July 10, 2009. Tim Albery, who staged the North American premiere of the opera, will repeat his duties for the NYCO production. It is fitting that Prima Donna should finally make its New York City debut at the Koch Theater within the Lincoln Center complex. The work was first announced as a co-commission by the Metropolitan Opera and Lincoln Center Theater. 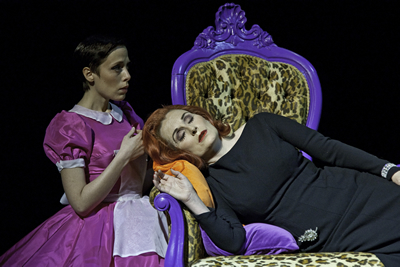 The Manchester International Festival later picked up the commission of the French-language opera.